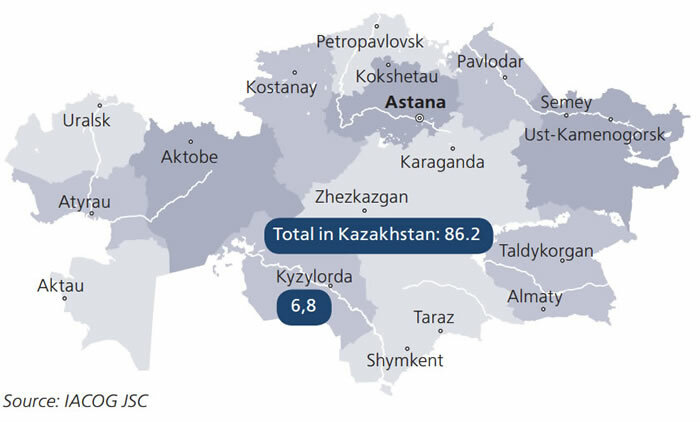 The share of the Kyzylorda region fields is a little less than 5% of the total proven and recoverable oil reserves in the Republic of Kazakhstan. Akshabulak, Kumkol, Konys and North-West Kyzylkiya can be attributed to the largest oil fields of the region. At the moment, 14 oil and gas producing companies are registered in the region, which are developing 59 oil and gas fields (6% of all fields in Kazakhstan). Nevertheless, oil and gas field of the region are classified as medium-sized and mostly small, and in this regard, in case of an active production, quick resource depletion is observed, with the exception of the recently opened small fields.. Thus, if in 2007, the share of the region in the total volume of oil produced in the country accounted for 17.4%, in 2017 this number is 7.9%. In 2017, 6,813.8 thous. tons of oil and gas condensate were produced in the region. On average, 18.6 thous. tons were produced in the region, representing 7.9% of production in the country. In recent years production in the region has been declining annually. In 2017 (as compared to 2016) decline was 11.2%. In historical retrospect, the highest production peak in the region took place in 2007 with a volume of 11.7 mln tons, then the the area accounted for 17% of the total oil and gas condensate production in the country. After reaching its peak production of oil and gas condensate is annually reduced by an average of 5% per year. Among the main reasons for the reduction of the production level are depletion and increasing water content of the fields. Before 2013, production was maintained at the expense of funds invested by the companies for carrying out additional measures to sustain level of production: drilling new wells, hydraulic fracturing (hereinafter - HF), bottom-hole acidizing and other additional well interventions (hereinafter - WI). 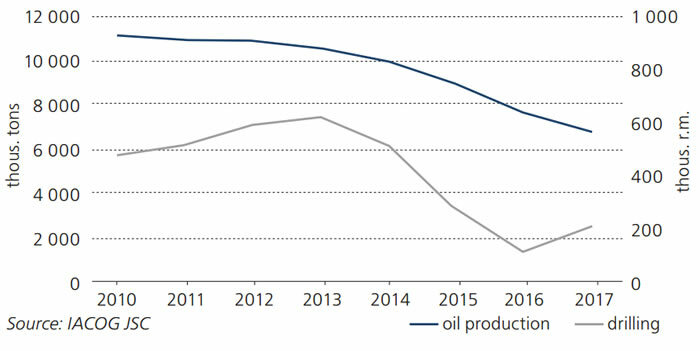 Since 2014, together with the fall of the world oil prices and the subsequent reduction in drilling volumes and WI by most of the companies, oil and gas condensate production continued to decline at a faster pace. In 2017, the annual average price of Brent oil fixated at 59.5 dollars per barrel, which is 31.9% above the level of 2016 (45.1 dollars per barrel). Together with growth of prices the volume of drilling rose as well. In 2017, for the first time since 2013 (!) drop in drilling changed its trend to growth. The rate of production decline has slowed down (in 2017, reduced production in the region totaled 0.9 mln tons (11%) against the drop by 1.3 mln tons (15%) in 2016) (fig. 2). 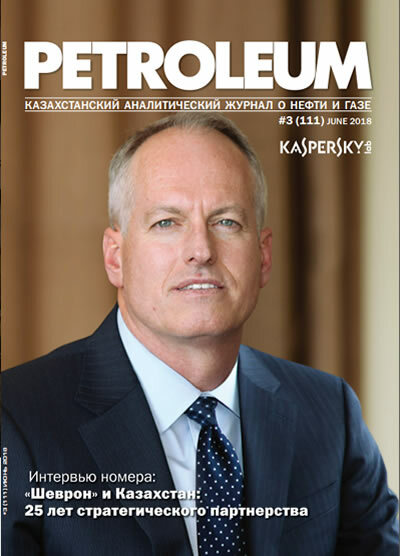 Referential: Until October 2015, Platts company kept evaluating the price of CIF Augusta Kumkol oil, delivered to the Mediterranean Sea from Kazakhstan. According to Platts, this grade of oil from Kazakhstan was brought by rail to the port of Batumi on the Black Sea, where it was further sent to the Mediterranean. Further evaluation of the cost of this grade stopped due to low volumes and lack of Kumkol oil supplies to the Black Sea. Small volumes of associated gas are produced in the region. Along with the oil production, gas production is on the decline (at an annual average rate of 5% per year). In 2017, 1,152 mln cubic meters were produced the region, which is 10.1% below the level of 2016. Average daily gas production in 2017 was 3.2 mln cubic meters. (2.2% of the total production in the country). 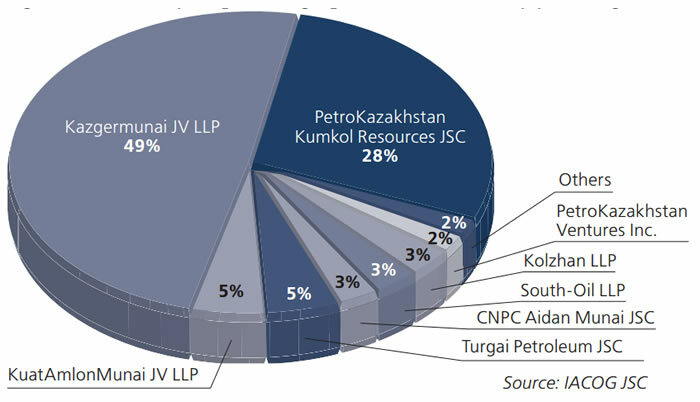 The largest companies by volumes of oil and gas condensate production in the region are: Kazgermunai JV LLP, PetroKazakhstan Kumkol Resources JSC, Kolzhan LLP, Torgai Petroleum JSC and South-Oil LLP. In 2017, these five companies accounted for over 80% of the total oil and gas condensate production in the region (fig. 5). The greatest volumes of gas production in the area account for companies such as Kazgermunai JV LLP, PetroKazakhstan Kumkol Resources JSC and KuatAmlonMunai JV LLP. In 2017, the contribution of these companies amounted to 82% of the total gas production in the region (fig. 6). Out of the total volume of oil production in the region more than 27% goes to export. The main volume is exported via Atasu-Alashankou (Kazakhstan-China pipeline) - 83.5% of the total oil export of the region. Through the Atasu-Alashankou pipeline oil is transported to the Chinese market. Less than 10% of oil exports is shipped by rail and 6.5% via the system of the Caspian Pipeline Consortium (CPC). Referential: According to Kazakhstan-China Pipeline LLP (http://www.kcp.kz), oil transportation via Atasu-Alashankou pipeline is conducted by Kazakhstan-China Pipeline LLP, whose founders are KazTransOil JSC (Kazakhstan) and CNODC (PRC), the maximum capacity of the pipeline is 20 mln tons per year. 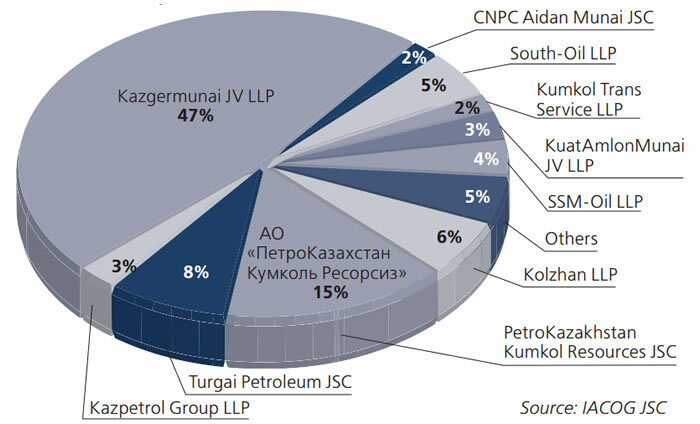 According to CPC (http://www.cpc.ru), the Consortium shareholders are the Russian Federation - 24%; KazMunayGas - 19%; Chevron Caspian Pipeline Consortium Company - 15%; LUKARCO B.V. - 12.5%; Mobil Caspian Pipeline Company - 7.5%; Rosneft-Shell Caspian Ventures Limited - 7.5%; CPC Company - 7%; BG Overseas Holding Limited - 2%; Eni International (N.A.) N.V. S.ar.I - 2% and Oryx Caspian Pipeline LLC - 1.75%. The annual volume of oil transportation amounts to 54 mln tons, however, the CPC expansion project involves growth of pipeline throughput up to 64 mln tons per year. From 2014 there is a decrease in exports and its share of the total production. 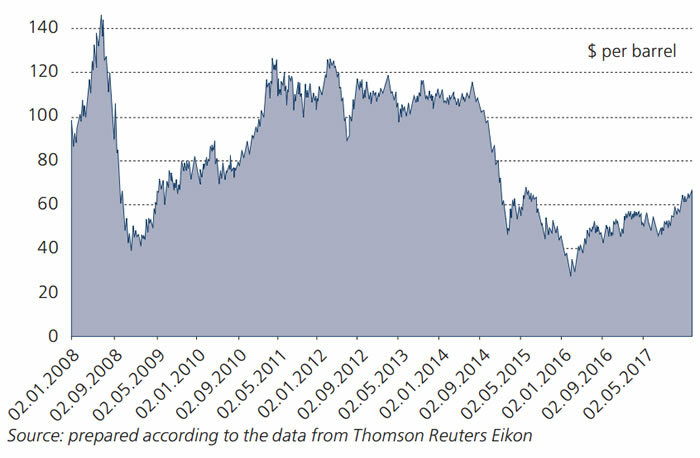 By 2017 oil exports declined to 1.8 mln tons, which is 2.7 times below the level of 2014. This decline is associated with declining oil production in the region by more than 30%. In the year 2017 oil delivery on the domestic market of the country, in contrast to the exports, on the contrary grew by 4.1% - up to 4.9 mln tons, representing 71.9% of the total production of oil and gas condensate in the region. On the domestic market the largest consumer of Kyzylorda’s oil is Pavlodar Petrochemical Plant (hereinafter - PPCP), where more than 2.5 million tons of oil from the region was delivered in 2017. Regarding mini-refineries, in 2017, oil delivery to these plants amounted to almost 74.9 thous. tons, representing 1.5% of the total delivery to the domestic market, and 1.1% of the total production in the region. However, in 2017 delivery to mini-refineries increased by 2.8%. Oil produced by Galaz and Company LLP is accounted for the major part of delivery. 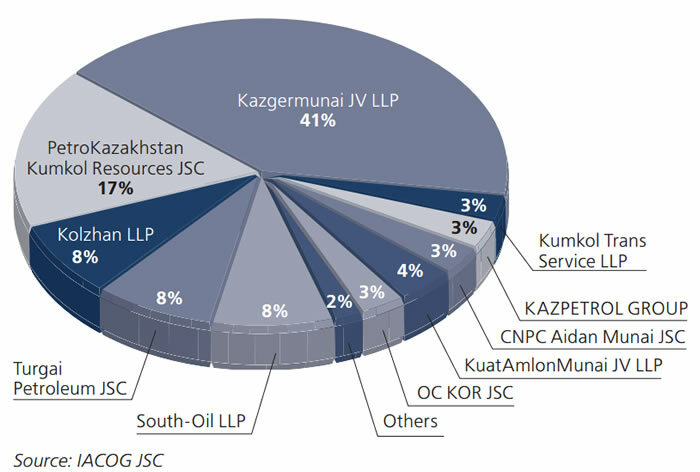 In general, the largest oil deliveries of the Kyzylorda region to the domestic market were shipped from the fields of such companies as Kazgermunai JV LLP, PetroKazakhstan Kumkol Resources JSC, Kolzhan LLP, Torgai Petroleum JSC and Kolzhan LLP. Together, they account for more than 76% of delivery from the region to the country's oil refineries. In conclusion: the region holds the fifth place in terms of oil and gas condensate production in the country. Along with this, in connection with the transition of the greater part of the fields in the region to the third and fourth stages of development in the absence of measures to increase and/or sustain oil production (WI, drilling, polymer flooding, etc. ), oil and gas production in this region will continue to decline.